Alex Grinch is the newest coordinator to venture into the DC graveyard that is the Big 12. The number of top line DCs that came to the Big 12 with fanfare only to find themselves on the receiving end of some knockout punches is extensive. Todd Orlando at Texas is one of the most recent examples, he had a fantastic year one in Austin only to middle about in year two with notable Ls from both Oklahoma schools, a near collapse in Lubbock, a shiner from Dana Holgorsen, essentially all the usual suspects. Before him there was Charlie Strong, before him Manny Diaz, and before him Will Muschamp had a solid couple of years with a few problems before bailing for the Florida HC job. Each of those guys tended to come in and inherit a veteran team that they utilized effectively only to fall apart when they faced the same OCs the following year without senior veterans to lean on. Jim Knowles came to the B12 last year with some ideas about how to attack the spread only to get the Air Raid baptism at the hands of Kliff Kingsbury, the blessed. Brent Venables was practically chased out of Norman, I could go on and on. Point is, Grinch has a tough road ahead of him. Alex Grinch this fall, probably. The ball doesn’t have any working knowledge of who it’s going to be thrown to, it doesn’t know the quarterback is supposed to throw it to a receiver, it doesn’t know it’s supposed to stay in the running back’s arms. So if the ball doesn’t know, then how on earth do we know? In fact, Grinch’s plan is nearly identical to the one that Kliff Kingsbury attempted with David Gibbs at Texas Tech for the last four years at Texas Tech. It was an attempt to game football strategy and allow the program to be built around what it did well, which was score. Lincoln Riley doesn’t want to have to overhaul his program to build a top line defense, he wants a defense that is really good at getting the ball back to his offense so that they be the driving force in victory. If you can regularly score 40 points a game on most any defense in the country then winning shootouts isn’t your concern, that’s your comfort zone. What’s the best way to win shootouts? Stealing possessions. Indeed that’s essentially how Oklahoma beat West Virginia and Texas. The Mountaineers had two crushing turnovers and Texas had a de-facto turnover when Oklahoma sacked Sam Ehlinger in the end zone. Of course some of that is just fun talking points for the media, the Sooners still have to have some kind of working plan for stopping the inside zone play from the spread and avoiding getting abused by slot fades. Otherwise they’ll be spending their time on the field chasing the ball and desperately pleading with the football gods to honor their secret rites of turnover creation. Texas Tech for instance, managed a +.7 turnover margin in 2017 and were barely negative every other year under Gibbs. All of their shifting and practice emphasis on turnovers yielded little on Saturdays. There’s two ways to achieve turnovers. One is to take away an offense’s strengths and force them into uncomfortable situations where the QB gets confused and flustered and turnovers just start happening. The other is to teach your players to err on the side of stealing the ball. For instance, going for the strip over worrying about getting a guy down to the ground as quickly as possible, or searching for chances to jump routes based off tendencies. Bob Stoops’ defenses were pretty good back in the day at jumping tendencies and regularly had multiple DBs with multiple INTs. 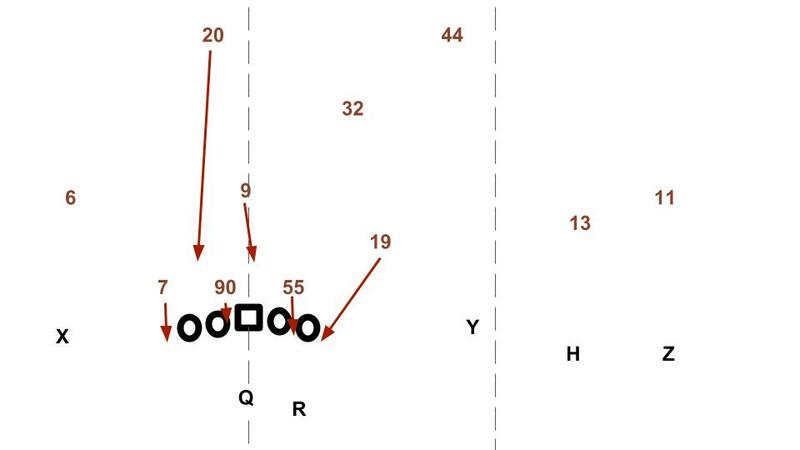 It was obviously just a teaching point, the Sooners taught their base schemes and techniques well and then prepped their defenders with crib sheets on when and where to expect throws. Venables in particular also has a reputation for stealing signs very effectively, which is another useful trick for generating turnovers. Grinch’s plan seems to revolve around lots of stemming and late movement across both the front and the secondary to keep the offense from getting clear pre-snap reads in either the passing game or the run game. His Wazzu defenses were particularly good at generating TFLs because of that movement and also because they had Hercules Mata’afa playing DT and shooting gaps. They played pretty small, used a lot of varieties of quarters coverage, and leaned on speed and movement to leverage the ball and get numbers to the point of attack. It’s good stuff against the “spread to run” game, the question is what happens against the “spread iso” tactics of the Big 12. What Grinch needs to take a careful look at is how Big 12 offenses flip the paradigm, throw to set up the run, and eliminate the ability of the D to create confusion and swarm the run. Holgorsen is gone now but it took Matt Campbell like three seconds to figure out how to flip the matchup games he had to defend in the Big 12 and incorporate them into his own offense, or else he always knew and just needed access to B12 skill talent before he could go wild. I’m guessing Neal Brown is going to figure it out in three seconds as well. Holgorsen loved to move a guy like David Sills V around until he was facing a guy that couldn’t cover him on a fade 1-on-1 and then chuck it deep. Texas ended up having to play that game with two high safeties and getting gashed in the run game without their normal +1 advantages (they also just played the run poorly that game). At Wazzu Grinch did use some of the inverted tampa-2 style robber coverage that Iowa State popularized in the B12 and occasionally tipped his toes in the waters of pass-first D. What you want to be able to do on D is to either encourage the offense to run a “three yards and a cloud of dust” offense into a movement-heavy front in the hopes of inflicting drive-killing TFLs OR have zone defenders positioned to jump routes. That’s why Iowa State’s inverted Tampa-2 is so effective for them, they can always swarm the run with numbers when they need to but a lot of the time they’re just sitting back and waiting to pounce on mistakes. The risk is that the offense controls the ball for long stretches of the game running into light boxes, wears you out over the course of the game, and avoids the shootout. But really, it’s not that great of a risk. The problem with that style is that shortening the number of possessions in a game with Oklahoma and counting on being more efficient with your possessions isn’t that great a bet. Trying to punch the ball across the field time and time again with the run is a strategy that often results in FGs and that won’t cut it. While it’s frustrating for a guy like Riley to watch his defense giving up yardage for minute after minute while his own offense sits on the bench, it’s actually a winning play if you can make it hard for them to finish drives. What’s more, if you only use up two minutes every time you score then it’s not all that easy for the opposing offense to keep you from getting the possessions you need to make winning contingent on scoring 30+. See the AFC championship game. The real concern should be giving up leverage to a Hakeem Butler or Tylan Wallace and allowing a single dude to go for 200 receiving with multiple scores. That’s when you run the risk of being outscored and beat. Oklahoma lost to Alabama because they couldn’t stop them or cover their WRs, the Tide could have won that game 45-34 (like they did) or 75-60, it was really just a matter of Saban’s preference for how they wanted to do it once they got enough stops in the first half to build a lead. If you want either to confuse an offense OR to jump tendencies the first thing you have to do in the Big 12 is avoiding getting spaced out and gashed on spread-iso schemes where the O can dictate terms and play pitch and catch with their favorite target. For the fourth consecutive season, the Sooners appear to be missing out on what should have been a big contract season from DT with NFL talent. In 2016 the volatile but explosive Charles Walker had injuries that held him back before finally just leaving the program to enter the draft. So they missed him for much of 2016 and then in 2017 when he would have been an upperclassman. Then in 2018 they missed out on what should have been a contract season from Du’Vonta “señor” Lampkin when he left early to pursue the NFL before having the breakout season that his talent promised. Now the Sooners have to go through 2019 without Amani Bledsoe due to a year long suspension after testing positive for a banned substance. It’s hard to enjoy the advantages of being Oklahoma if the premier talents you bring aboard on the DL don’t maximize on campus. For 2019 they still have Neville Gallimore at the nose, a cast of other nose tackles that don’t strike fear into anyone, some young unknowns at DT, Kenneth Mann, and then some promising talents at OLB/WDE like Ron Perkins and Jalen Redmond. Grinch also inherits “the Caleb Kelly problem” which is having a big, talented linebacker who doesn’t know how to play inside and has to be protected over the top against the slot receivers you face in the Big 12. Ruffin McNeil solved that problem in the Big 12 title game by moving their best CB (Tre Norwood) behind Kelly at SS, surprising Texas, and then hanging on in the second half and winning with a well-timed CB blitz. They caught Texas by surprise but it wasn’t a long-term solution and didn’t hold up against Alabama in the playoffs. So, Grinch has a team without the kind of star DT that can blow up blocks and thwart schemes, with a 5-star LB that serves as a governor on the coverages the team can play, a group of CBs that haven’t been taught to find the ball in the air, and a dearth of proven safeties. That’s the kind of set-up that can make for tough sledding and it’s all occurring in a year in which the offense is destined to take a dip. So what’s the solution? Just straight up steal Iowa State’s defense. What you want is to create confusion about whether a safety, corner, OLB, etc is going to serve as an extra man in the box with a set-up that doesn’t have obvious weaknesses down the field in coverage. Looking at this set-up the offense is going to be thinking “okay, obviously we want to run the ball here.” But it’s obvious if, how many, or which of the different speedy athletes on the field is going to end up in the box by the time the RB has the ball. One thing the Sooners do have is a number of bigger, sturdier guys that could theoretically be taught to be good tacklers and run support guys. They need to leverage that and avoid leaning on a non-existent ability to match up with B12 skill talent on the perimeter. Additionally, all the blitzes and stunts that could be coming could also cause confusion and encourage the offense to add blockers to the field to just try and run OU over. That should be exactly what OU wants, for the offense to try to get them back into the base 4-3 and to abandon the pursuit of trying to fling the ball down the field on their secondary. They want to outnumber offenses on the perimeter and then rely on guile, speed, and confusion to inflict negative plays or generate takeaways. The path forward for Oklahoma is going to revolve around getting smaller and more versatile, causing confusion, and positioning DBs to get good jumps on the ball. Every snap OU should be able to threaten to bracket most every WR on the field or load the box with more speedy defenders than you can block without the offense being confident of which and having a ready, easy pre-snap read. Grinch has the defensive structure to do this in terms of call language, teaching versatility, and relying on speed. From here it’s mostly a matter of adjusting his personnel packages and what worked in the Pac-12 to what will be necessary in the Big 12. That’s the way to game the system, generate turnovers, and prevent offenses from having a shot to outscore their own potent offense. If Grinch and Riley are really serious about using a new paradigmatic approach to defense they’ll attempt something more like this rather than hoping to out-execute opponents with traditional defensive strategies. I don’t hate it. My worry is #9 staying at Mike. #19 in space. #13 on quick screens. And not finding a way to get Redmond and #7 on the field together. 19 is good in space laterally, you just don’t want him to have to carry verticals. 13 on screens should be less of an issue if he can cover down and you have 19, 32, and 44 in pursuit on like a swing screen. It’s an issue but probably not a killer. Depth should be OU’s defense’s strength. The coaches need to maximize this. I think Kelly is good if he’s more on the edge. He’s not great but he’s good. Murray I think gave up on the scheme and just started running to the ball. I agree with you Ian that there was a lot of good in this press conference but also some concerning points. – Good Offense now beats Good Defense (corollary is offense wins championships). – Football is no longer a game of position on the field. It is now a game of ball possession (corollary is yardage doesn’t matter but getting the ball back does). > The focus on turnovers is concerning if he truly views turnovers as the endpoint. Turnovers are the end product of defensive tactics sometimes, but there is too much randomness in turnover generation to view them as a viable readout. – To get interceptions, increase % of passes defended (teams intercept about about a third of passes defended). This then becomes about baiting and pressuring QBs into bad reads and challenging catches. – To get fumbles, get into the backfield and increase the number of defenders rallying to the ball. This then becomes about penetration by the DL and effort by all defenders to get the ballcarrier. Third down defense has changed. The adage that good 3rd down defense is a product of good 1st and 2nd down defense is less true now that teams have really efficient passing games designed to pick up 3rd and 7 – 12 at high rates. Teams with good 3rd down defenses are usually aggressively jumping on the offense’s preferred tendency to make them look at less efficient options for getting those critical 3rd down yards. Red zone defense is again about hyperfocus on situational football. Making the offense go to plan B plays that they’re uncomfortable with is the goal. > Limiting the number of OU offensive possessions SHOULD be the preferred tactic of opposing offenses. This is the opposite of what you’re contending. OU’s incredible efficiency has recently yielded TDs on roughly 60 – 70% of possessions. Field position really isn’t an issue for the Sooner offense because of this efficiency. This is because low possessions equals high variance games. With fewer possessions, the impact of one failed possession is amplified. The 2018 OU-Army is the extreme example. 3 TD, 1 missed FG, 1 goal line stop at the one yardline. > I agree with the affinity toward Iowa St’s defense. One thing OU has the Iowa St doesn’t is quality depth. OU’s defenses in the 00’s were apparently famous for having qualitity depth across the board. OU’s defensive coaches haven’t used this depth to the teams advantage. I don’t think OU has had quality depth in recent years, I think their development on defense has fallen off too much to enjoy that benefit. Their defensive roster a year ago was no better than much of the league. The problem with the low possession strategy is that OU was more efficient about finishing drives with TDs than other teams. Because they scored from outside the red zone regularly and because they had too much going on in the red zone as well. I get and have argued on behalf of the “shorten the game, increase the variance” strategy before but it just doesn’t hold up as well now because the passing attacks are too good. It almost worked for army but army was legit solid on D, OU missed a not that difficult field goal, and army got turnovers. Also, Army was uniquely equipped to pick up 3rd/4th and short all day. Most teams couldn’t follow a similar ball control strategy if their lives depended on it. For most of the B12 the better play was to embrace a high number of possessions because a worn down OU D was so bad that it could elevate the opponent O to a level comparable to the Sooner O. Texas went at OU and that’s why they beat them once and had a good chance in round 2. Ditto Bama. We definitely agree on the poor development of OU’s defenders. The yawning gulf between Tim Kish and Brent Venebles in LB coaching is phenomenal and readily apparent to the casual observer. – Kenneth Murray: fewer plays (about 50 per game), Pilates and ballet to improve hip flexibility (almost seriously). Let him blitz more, read less. – Ryan Jones: let him lose weight and build strength. He needs to do HIIT 20 minute workouts twice a day and drink alfalfa shakes. Attend a TCU camp undercover to learn leverage and aggression. Play him in space. – Deshaun White: GET HIM ON THE FIELD. He looked good out there at MLB, being in position and tackling. Makes quick decisions. Need to see if he can cover and chase plays. I also want to see the other highly recruited Fr/So that OU has on the roster that were apparently so good we couldn’t see them (Asamoah, Bonitto, Draper). Even if Murray is better than these guys at the start of the game, after play 70, K9 (his nickname), is exhausted and is slow to get to guys in the flat and is content to stay blocked. DON’T LET HIM GET THAT TIRED. There’s a reason NBA teams sub players in after 6 – 9 minutes in games, even in the playoffs. Plus getting the youngsters in keeps them engaged and accelerates their development. Your hypothesis that OU’s defensive teaching was such a net negative that it turned possibly productive players into negative is plausible. That may be why they played their starters too many snaps. I was going on the hypothesis that OU’s defensive coaches were under so much pressure that they didn’t feel they could trust inexperienced players. I’ve heard a few good things about Dashaun White, also I remember him in recruiting and Texas really wanted him/I thought he’d be a super useful addition. I was talking with Kegan Reneau recently, he thinks OU should go 3-3-5 and play K9, White, and Kelly as the LBs with five DBs. I think that’d be a step in the right direction and a solid base package but I think spread teams would still shred that, hence my call for the inverted tampa-2 dime. The idea that OU just felt like they couldn’t trust the back-ups is solid except that the starters weren’t all that disciplined or well-oiled looking either. So it seems more likely that OU doesn’t have anyone on the fast track to development. LOL at “attend a TCU camp undercover.” Patterson always gets all his guys ready to play and survives injuries. My guess is that Patterson spends more of his program’s practice time having the defense do heavy work, adds wear and tear on his players that increases injuries, but then makes up for it because the back-ups get a lot of live tackling and play work in practice that sets them up to fill in. Just a guess. Also watching how many plays Oklahoma has on offense to attack different coverages and opponents I wonder if they set up a lot of their practice time to make that possible in ways that reduces the quality work that the defense can get. Again, just theorizing and wondering out loud. For instance, TCU always works in everything that Patterson has ever seen an offense run along with his tips and instructions to his players for how to handle it. Surely a lot of that comes against the scout team but at the very least it leaves the offense over in a corner doing their own thing. Your example of Texas and Alabama is correct, but only for those teams. The Horns and Tide were the only two teams on OU’s schedule that had the raw talent, specifically on their defenses, to contend with OU. For the other eleven teams on OU’s schedule, their defensive strategy was basically, “if OU makes a mistake on 2 – 3 consecutive plays on this drive we can get off the field.” The Oklahoma offense was scoring on TDs on about 70% of non-garbage time/non-end of half possessions last year. OU lost focus on offense vs Ok St, and played Bookie too long vs WV keeping those games too close. Otherwise, the math is favors the low possession strategy. I think this remains true for the 2019 version of the Sooners too. Craig Kuligowski was let go from Alabama. He’s got a great track record, including Bama but at Missouri and Miami too. OU, or another school, needs to deepen the Missouri connection here. Huh, why’d they let him go? Supposedly just clashed with Saban. But nothing has been officially said why. Great fit for the Sooners. > OU needs to bring him in as an analyst. Ruffin leaves after this year. > Kuligowski + Thibodeaux + Odom run the front seven. > Kuligowski recruits the Mo, KS, TN, IL. Odom does OK, AR, DFW. Thibodeaux gets the rest of TX.